Few things in life are guaranteed. There is no promise we’ll have enough money. No one can guarantee good health. We’re not even promised tomorrow. There is one guarantee, however, we are given. Jesus tells us in John 16:33, “You will have suffering in this world“. That’s not a very pleasant promise! But wait! Keep reading the verse and you hear Him say, “Be courageous! I have conquered the world“. You see, we are guaranteed suffering, trials, challenges, setbacks…you name it. Things will happen to us. Sometimes these are unexpected, but more often than not we bring them on ourselves. I can’t begin to tell you the number of trials, challenges, setbacks and struggles I have faced over the past couple of years. I know all too well that these things do indeed come. And, I know firsthand how difficult it is to stay positive when these trials happen. So, what do we do? That’s where the second part of the verse comes into play. Jesus tells us to be strong…be courageous. Why? How can we be anything but afraid when our world seems to be crashing down around us? Because He has conquered the world! And, if we are saved by faith in Jesus Christ, then we too have conquered the world. In Him we have nothing to fear! What an amazing promise! I’m sure someone reading this is facing a challenge, trial, setback or struggle today. I am facing many! My words to you are these. Be strong! Do not fear! He who overcame the world and death has empowered you (and me) to overcome the challenges you face. Put your faith in Him alone, and lay your fears at the foot of the cross. Believe that He will lead you through any trial you face. I’m telling myself these things daily, and I believe that He will provide, comfort, heal and empower. I’m reminded of a song. 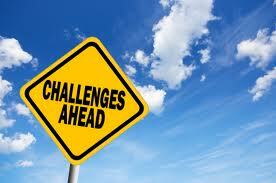 What fears, challenges, stresses, setbacks, trials, etc. do you need to take to the cross of Jesus Christ?